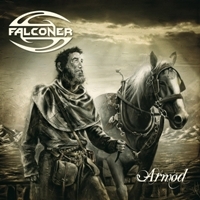 Falconer is a band that always had influences of traditional swedish folkmusic in their power metal and this album is as if they say: "One off" and not the new direction of Falconer. On Armod all lyrics are in Swedish and the keyboard is replaced with fiddles and flutes. Falconer's strong man and founder Stefan Weinerhall has made the band popular amoung the fans of viking-metal with the their own sensual style of metal. With the leadsinger Mathias Blad, who doesn't really have a rock background, has Falconer made a very special record with Armod? As a Swedish writer and listner I wonder how the international fans will receive this? I must say that they are brave as hell to do this very powerfull mix of folk music and heavy metal. Some tracks are quite good as metalsongs, specially track nr 1 Svarta Änkan, but for an entire album it's hard to not be tired and bored. Best tracks: Svarta Änkan, Griftefrid. For me it's too much folkmusic and I hope that they will go back to the sound they had on the earlier albums. One off a lifetime album, keep that promise please. The loyal fans of Falconer folk metal style might like this more than me. Congrats to you. Falconer Lineup 2011: Mathias Blad on lead vocals, Stefan Weinerhall on guitar and keyboard, Jimmy Hedlund on guitar, Magnus Linhardt on bass and Karsten Larsen on the drums.